Minister for Communications, Energy and Natural Resources Alex White T.D. attended the completion ceremony of the Louth Energy Pilot Project in the Louth County Council offices in Dundalk. This project saw the energy upgrade of 2,100 local authority homes throughout Louth. The works were completed as part of the Better Energy Communities 2014 programme, part-funded by the Sustainable Energy Authority of Ireland (SEAI). “Technology is changing all our lives and this project carried out by Louth County Council is an example of the type of technology that is life changing for homeowners, who are now able with “climote” to easily control their heating timings and temperature via a smartphone, text message or online which is increasing energy efficiency and reducing wastage. The upgrading of local authority residents heating systems, has delivered tangible results with Louth County Council reducing energy costs for homeowners as well as improving the Building Energy Ratings of the Council’s housing stock. Ultimately it is families who have really benefitted from the introduction of this scheme”, said Cllr. Peter Savage. “Officials and engineers from Louth County Council along with our project partners Electric Ireland, SEAI, Climote and Kingspan have worked tirelessly to bring this project to fruition and complete a scheme, which began with a trial of the climote remote control home heating system in 40 homes in Cooley Park, Dundalk in October 2013. Since then we have seen 2,000 homes from the Cooley Peninsula down to Drogheda upgraded with a climote remote control heating systems and a further 100 homes receiving a full energy upgrade including insulation from Kingspan”, said Cllr. Peter Savage. Declan Meally, Head of Department in SEAI said: “The project in Louth is just one of many that have grown from innovative partnerships that have evolved in the region. The benefit of a Local Authority and business working together to assist new local enterprises demonstrates the real value of partnership and is another way of delivering local jobs. The other benefit is to the homeowners who are struggling to pay energy bills and who now have the ability to actively manage their energy use. The uniqueness of this scheme is highlighted in the collaborative approach undertaken to fund the energy improvement works with financial and technical guidance provided by Electric Ireland, who as the major co-funder of the project has been involved in energy efficiency improvement works undertaken in Dundalk over the last few years, including €3m spent on the Cox’s Demesne Regeneration Scheme. Paul Stapleton, General manager, Electric Ireland said “being a major energy provider in the country it is important as an organisation that we contribute to the energy saving of our end user, in this case local authority residents who are experiencing fuel poverty. 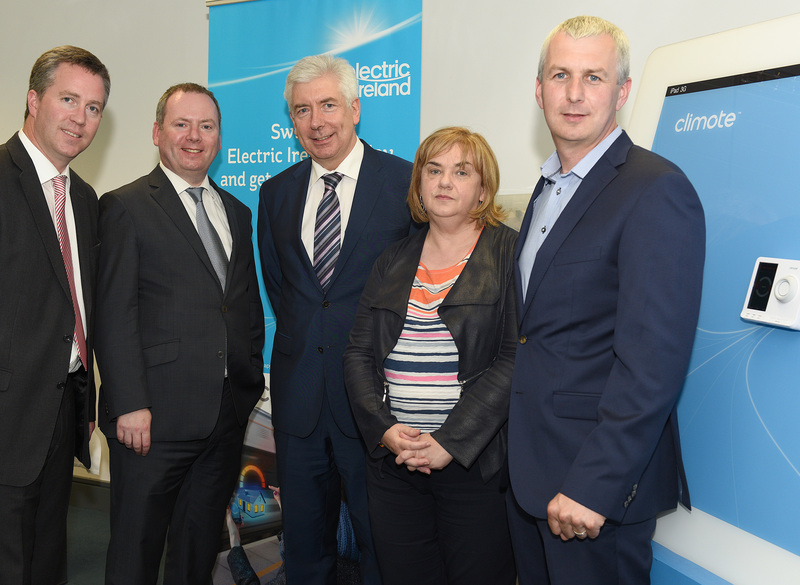 The funding and technical support from Electric Ireland allows projects of this size to be successfully completed. “The scheme has proved to be extremely successful for the Council, our project partners and most importantly the residents. We all have a responsibility to make this country more sustainable in terms its energy consumption and Louth County Council is playing its part in implementing schemes like this one which are helping to radically reduce energy intensity and usage. Louth County Council is exceptionally proud of our work on this scheme and we believe that along with our project partners, we have made energy efficiency a key priority and are a leading example for other local authorities in Ireland”, concluded Louth County Council Cathaoirleach Cllr. Peter Savage.